The Bulgarian Society is a cultural society. Our aim is to protect, promote and the develop the Bulgarian traditions and culture in Nottingham. The Society's committee has planed various cultural and social events. Our goal is to proudly present the beauty of our ancient country, the ever-lasting traditions and customs, and the warmth of our people. Bulgaria can offer something for everyone - from delicious national dishesh, which could only be tasted here, to summer and winter resorts, wrapped in the beauty and mystery of this ancient country. Ancients buildings, historical monuments and world-wide known treasures, had made our country one of a kind! Bulgaria is located in South Central Europe. The terrain is varied, containing large mountainous areas, fertile valleys, plains and a coastline along the Black Sea. It has around 7 million citizens and its current President is Rosen Plevneliev. As one of oldest countries in Europe, Bulgaria can offer something for everyone. 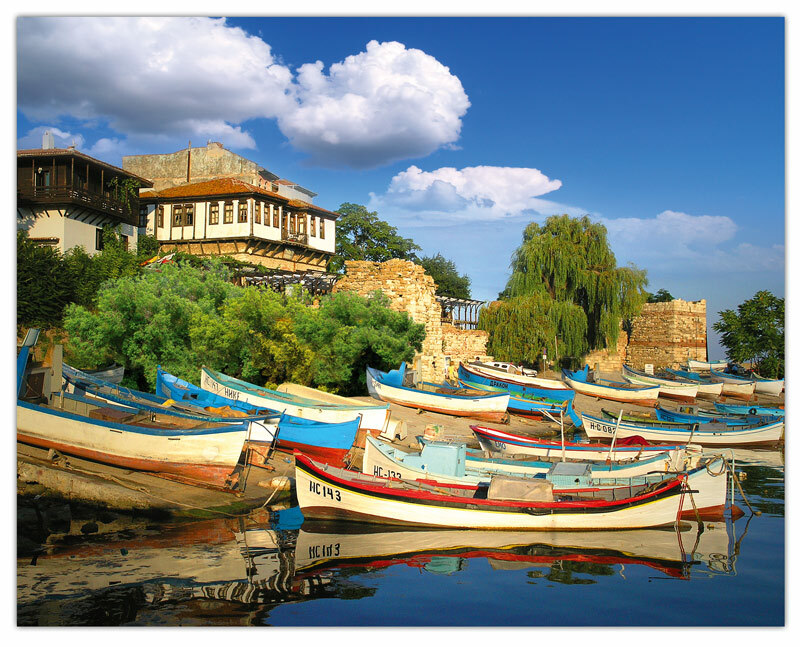 For those loving the sun, the sandy Black Sea Coast boasts swaths of stunning beaches and picturesque bays. From the crowded Sunny beach to the quiet ancient Sozopol, family vacations and crazy nights out are a promise. For others, who may describe themselves as "nature lovers" Bulgaria provides networks of well-maintained hiking trails and horse-riding routes. lush mountainous and forested landscapes, especially around the Rila and Pirin Mountains, inhabited by bears, lynx, rare birds and other kinds of wildlife now becoming scarce elsewhere in Europe. Here you can come across remoter, rural corners, where the traditional, slow pace of life continues much as it has done for centuries. You will face multicoloured monasteries, filled with fabulous icons and watched over by bushy-bearded priests, and impossibly pretty timber-framed villages with smoke curling lazily over the stone-tiled roofs and donkeys complaining in the distance, where headscarfed old ladies and their curious grandchildren still stare in wonderment at the arrival of outsiders. Bulgarian food, customs and traditions are admirable and can enchant everyone from young kids to mature adults. They have been preserved through many hundreds of years, combining the modern Bulgaria with the ancient Bulgaria. Everyone who comes to Bulgaria and faces the Bulgarian culture, nature and love, will want to come back again and again. Bulgaria is famous for its "Baba Marta" (Grandmother March Day). Martenitsa is a small piece of adornment, made of white and red yarn and worn from March 1 until around the end of March (or the first time an individual sees a stork, swallow, or budding tree). Baba Marta is a Bulgarian tradition related to welcoming the upcoming spring. The month of March, according to Bulgarian folklore, marks the beginning of springtime. Therefore, the first day of March is a traditional holiday associated with sending off winter and welcoming spring. Bulgaria is also famous for its extremely delicious dishes. Once you have tasted the national cuisine, you would fall in love with it. From variety of soups like "Tarator" cold soup made of yoghurt and cucumber (dill, garlic, walnuts and sunflower oil are sometimes added) to Cheverme (One of the best Bulgarian grilled dish with meat. Cheverme is a method of grilling lamb or pork meat (the whole cleaned lamb) over open fire or hot coals. It is a long process that takes about 6-7 hours and during this time the lamb should be poured with melted fat. When meat is ready, it is covered with pine branches that give it a special and unforgettable flavor. Lamb is then cut into smaller pieces and served. Wide variety of salads, sauces, bread, main dishes and side dishes and many more. This in what you find only in the Bulgarian cuisine. Bulgarian society is a cultural society. Our objectives are to protect, promote and develop the Bulgarian culture abroad. We achieve this trough various socials, sport events and trips mainly within the UK. This university society is proudly sponsored by Expert Market, investing in the minds of tomorrow.